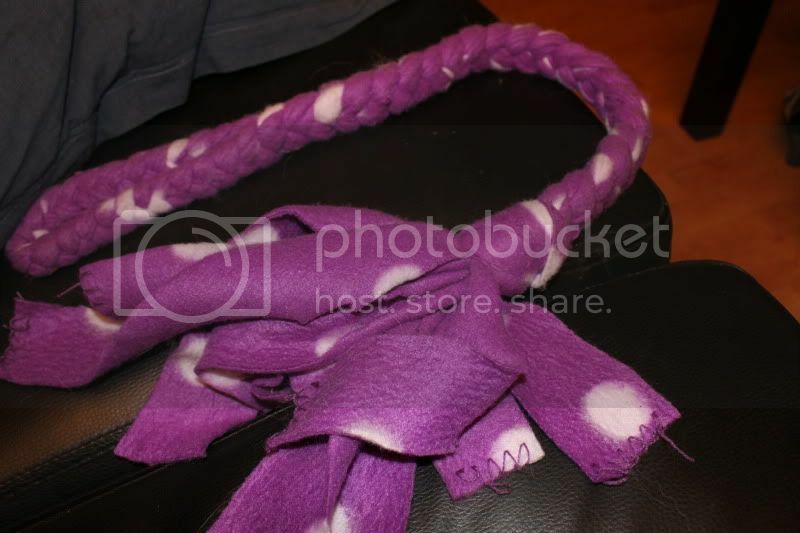 I'm also going to start making my own tug toys! Remi is in a destructive stage and I'm spending way too much in toys. All of those ideas are great! This is the machine that I have http://www.johnlewis.com/231616748/Product.aspx and, as you can see, they're really not that expensive and work well! I got a email for Barkbox today. Here are 19 DIY projects. I love the dresser used as a dog food/water space. I love all the DIY projects on the Barkbox! I'm going to do the denim tug toy for sure and look into the others. My favorites on there is the dresser, seat cover and treats. This one has a loop so it is easy to hold on to. Jinx relly likes this one. I have one in blue that is a bit shorter, that I use for agility. 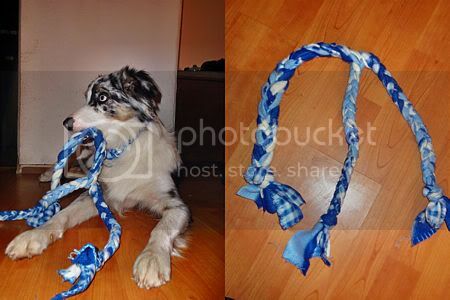 I love the tug toys and leashes you made, Anneke!!! Gracegeorgina, LOVED the sweaters, they do like look shop bought ones, you have a a real talent! Squggle, thank you for the video, always wanted to know how to do that braiding. Plus, we go through tug toys like there's no tomorrow, and they're so easy to make - once you know how! The jeans leads look great too! Boy once I've finished my current project, will have to start working on all these doggy ones! This is the teeter totter that I made a week ago!!! You made your one Teeter totter? That is sooo cool!!!! If got the stuff dor making a few jumps, but I still have to start that project. Love this thread, so many great ideas. Gotta finish the projects I'm working on at present and get cracking with doggy ones! Love the teeater totter How did you do that? Dogcrazy can I ask how you made it? 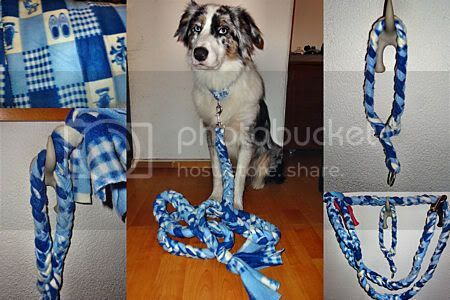 I'm interested in making one for Remi, and yours looks amazing! I'd love to know how you made the Teeter Totter, or at least detailed pictures and dimensions! I love the Dog Silhoettes! And the Collar/Leashes. I hope I can make some for the dogs for Christmas! I used this plan to build it. Except I primed the board first. It was a lot of fun to make it!!!!!!! Thank you Dogcrazy. It looks like fun to build, such easy instructions. And I think I've already got enough outside paint too.! Plus you've solved my 'what to buy the boys, well Ra Kismet anyway, for Christmas" problem. Ra Kismet will just LOVE it though I doubt Zeus will try. Here's a link to Dog Collar Hardware Sets on Etsy. I thought it seemed lazy at first, but it isn't a rip off, and some of the things are kind of hard to find. Thank you couldn't find anywhere to buy the hardware! Didn't think of Etsy. I found an awesome way to make Dog Tags! And just print them off! You can make 18 for $12 (+Shipping), compared to the normal like $20. I made shrinky dink dog tags, and unfortunately found that they didn't hold up :-( They get very hard with baking, but couldn't hold up on the dog (or cat's) collar--the tags all broke within a few weeks. Thanks for the warning, I was going to try them out!!!!! !